The Green Skeptic likes to talk about the New Green Economy. For a long time, I've been nattering on about how America needs to get its act together and seize the opportunity of the a new, greener economy. We snooze; we lose. China, India, even old rivals Japan and Germany, are poised to take the lead in every major part of clean tech and alternative energy development. What's at stake? Plenty. Only a multibillion, some say, multitrillion dollar business opportunity. But at the Aspen Environment Forum last Saturday, Van Jones and Majora Carter reminded us what else is at stake -- and what seizing this opportunity could mean for America. It could mean, to paraphrase Van Jones, founder of the Ella Baker Center for Human Rights, moving from an economy of pollution and incarceration to one of solutions and green jobs. Jones, along with Majora Carter, founder of Sustainable South Bronx, called on the crowd -- and are calling on the rest of America too -- to help them launch "Green for All," a kind of green job corps for those currently left on the margins. "FDR had the Civilian Conservation Corps, with young people going all over America to enhance and build parks," Jones told the crowd in Aspen. "JFK had the Peace Corps, and Clinton had AmeriCorps. It's time we had a Green Job Corps." The green-collar job sector is growing in the United States and could include more than 14 million workers by 2017 industry, according to some analysts. The American Solar Energy Society says there are there are potentially 8.5 million U.S. jobs that can be considered "green." That figure could grow by 5 million in the next 10 years, Jerome Ringo of the Apollo Alliance told Steven Greenhouse of The New York Times in an article last week. Green-collar jobs include "Ph.D.'s and Ph.-do's," said Jones. "We need people who are highly educated at the theoretical level and we need people who are highly educated at the level of skilled labor." At least 28 US states have chartered mandates pushing for renewable energy to be 10 to 25 percent of their energy portfolio over the next few decades. "The development of a green economy creates a broad new set of opportunities," Lois Quam, managing director for alternative investments at Piper Jaffray, told the Times. "When I first started looking at this area," Quam said. "Many people commented on how this will be as big as the Internet. But this is so much bigger than the Internet. The only comparable example we can find is the Industrial Revolution. It will affect every business and every industry." Jones calls such jobs "green pathways out of poverty." "Right now we don't have the infrastructure to train a sufficient number of green-collar workers," Jones told the Times. "If we are going to weatherize buildings, they have to be weatherized here. If you put up solar panels, you can't ship a building to Asia and have them put the solar panels on and ship it back. These jobs have to be done in the United States." Check out the "Green For All" presentation from the Aspen Environment Forum 2008: (Clip 1) with Majora Carter, Van Jones. Watch video. "The 5th Skoll World Forum for Social Entrepreneurship took place last week in Oxford. This powerful, inspiring forum led by Jeff Skoll and Sally Osberg celebrates and connects social entrepreneurs to the world and is making "social entrepreneurship" known to governments as well as businesses. This year's highlights were the speeches of Lord Anthony Giddens (climate change: opening plenary) former President Jimmy Carter (keynote: Skoll Awards Ceremony) and Paul Farmer and Al Gore (both in the closing plenary). There were 11 Skoll Awards given out this year and Kiva (Matt Flannery and Permal Shah) was one of them. This was the second year in the row that I attended Skoll Forum and it is an awesome experience to be 3 days in a place where you see over 700 people trying to make a world a better place. One of the ventures that I was very impressed about is E+Co which empowers local enterprises in developing countries by providing business services and financing so that these enterprises can deliver clean and affordable energy to households, businesses and communities. There are several sessions that are covered by video and are all highly recommended." I look forward to catching up on the Forum. Clean Tech: Solar Stocks On the Rebound? "Solar stocks capped a fantastic week with every solar stock except one (WFR) clocking a double digit gain. 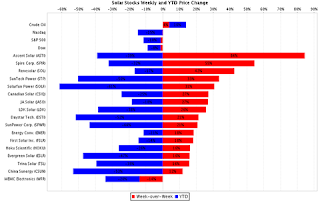 This seems like the best week solar stocks have had this year but are still far off from where they started in 2008. "The biggies, First Solar (FSLR), Suntech Power (STP) and Sunpower (SPWR), all made impressive comebacks. I am kicking myself for not buying Suntech Power (STP) when it was in the 30's. I was closely watching it and was hoping to enter Suntech in the high 20’s. Well, before I knew it Suntech goes from 30 to 40 in a week. "The question is have the Solar Stocks turned a corner here? I don’t have the answer. Do you? Do you see this as an opportunity for a short-term short, or are you planning to go Long?" Everything we think about saving or protecting ecosystems and habitats is wrong. This week, I'm at the Aspen Environment Forum, where tomorrow morning I'll be on a Panel called "Nature's Place: Saving Ecosystems and Habitats." For the better part of 15 years I worked with The Nature Conservancy to save some of the world's "Last Great Places" around the world (I left in August; see my posts reflecting on my career at TNC). I consider myself a conservationist, not an environmentalist. What I mean by that is a conservative and prudent approach to our use of resources that requires us to manage them for the long-term -- for the benefit of people today and for future generations. The Green Skeptic grew out of an increasing concern about our relationship to the natural world and how we protect it. I am a skeptic in the sense that I believe we need to constantly challenge the assumptions we have about "saving ecosystems and habitats." 4. We can't trust human ingenuity and community to manage its own resources. First, I need to step back and look at the words we use. (I am a poet, so words matter to me.) Specifically, "protecting" and "saving." Both imply we need to keep ecosystems and habitats from something. The American Heritage Dictionary defines protecting as "To keep from being damaged, attacked, stolen, or injured; guard." When we use the word protecting in terms of ecosystems and habitats, we are guarding nature from something or someone, presumably humans. Saving is a little less problematic, as it implies a conservative approach to the future (as in saving seed corn for next year's sowing). Still, the AHD's first definition is "To rescue from harm, danger, or loss." It's not until definition number three that we get to the conservative impulse: "To avoid spending (e.g. money) so as to keep or accumulate it." The question is not about what we should save, but how and for what purpose. Is it hubris to assume we have protected or saved anything? We promote the fact that percentages of ecosystems or habitats are protected, but they continue to be encroached upon -- see the Amazon Rainforest for example. What have we really saved if massive changes from climate change or the drive for much-needed economic development will have significant impact on the future status and makeup of places, habitats, and ecosystems? Climate change will disrupt many ecosystems that exist today -- much as the Internet disrupted print media, the travel industry, TV, bookstores, you name it. It will change everything. So the question is what are we really protecting when we talk about protecting ecosystems and habitat? Will the places we select for protection today be the same 10-20 years from now? Probably not. Ecosystems are constantly changing, either from "external" (human) or "internal" (natural) forces. Change is inevitable and could, in the face of global warming, be dramatic. Shouldn't we be preparing for the changes and begin to think about how we adapt to some of the most likely changes, those brought on by climate change or economic development or basic human needs, such as for food and energy? Demand for energy and food will drive economic development for years to come and we can't continue to ignore these drivers to "save" the natural, non-human world. This leads me to assumption two, which is about ignoring basic human needs. It's irrational for us to think that people in developing countries, many of whose basic human needs are not being met, will care deeply about the non-human natural world. Yet, we continue to have blind faith in our cause and ignore the needs of real people. I recently returned from India where the extreme poverty is evident almost everywhere you look. Also evident is a growing middle class that strives for the kind of lifestyle we have here in the west, specifically the US, with its inherent accelerated pace and impacts. Who are we to say that people in developing countries have no right to the kind of lifestyle we have exported for decades? We can not convince, persuade or cajole or even pay people -- Americans as much as people in developing nations -- to "come around to our way of thinking," and yet this is what I hear whenever I talk to environmentalists. And we can't ask poor people around the world to forgo the comforts of the lifestyle we have been living, and which they wish to copy, "for the sake of the planet" or to set aside their habitats and ecosystems for the sake of humanity. No country wants to become an ecological reserve for the world, especially if it means it cannot pursue economic prosperity. Try floating this idea with people who go hungry every night for lack of food or money to buy food and see what kind of reaction you get. In the end, poor people matter. And the governments of Brazil, China, India, Indonesia and African countries must be concerned first and foremost with the well-being of their people. I'm not saying that human well-being isn't tied to ecosystem health; I'm a strong believer that economic growth is tied to those resources. I believe we can no longer separate the issue of economic development and poverty alleviation from ecosystem health. We also can't expect that governments whose people aren't meeting basic needs to protect their habitats over the economic well-being of their people. Which leads me to assumption three: increasingly, we are entrusting protection of habitats and ecosystems with the wrong people. Governments have a mandate to improve the economic health of their country and people. Yet we continue to have faith that these governments will "do the right thing" and enforce laws protecting their forests or other ecosystems in the face of seemingly insurmountable economic obstacles. Why do we think that is a good strategy? What indicators do we have that tell us this strategy will succeed where it hasn't in the past? Why do we think that the World Bank program to pay countries to "avoid deforestation" will be any more successful than their previous grand plans? The same goes for NGOs. NGOs are basically corporations that serve a set of shareholders (donors in this case) who subscribe to a specific idea of Nature and a specific set of outcomes, outcomes that may not necessarily be shared by all stakeholders. This idea of Nature has for a long time discounted the needs of people both today and in the future. To illustrate this, one only need look at the environmental community's approach to government debt. Conservation groups (my old employers among them) have promoted using a country's debt as leverage to gain conservation protection. The debt-for-nature swap was an innovation of the past couple of decades and a noble one. But it was also painfully ignorant of the true nature of that debt -- in many cases "dictator debt" incurred by regimes that did not have its people's best interests in mind. Now that we have a more clear understanding of how that debt was derived, and can no longer ignore its immoral origins, we need to give up or adjust the debt-for-nature swap concept and join the call for debt forgiveness. That will free some countries from having to exploit their natural resources to pay down that debt. Yet, many in the environmental community continue to push the debt-for-nature strategy, because they can't let go of a good thing that advances their agenda. How is this different from any corporation -- a sector many environmentalists attack -- that advances its agenda at the expense of people here and abroad? Can we really trust ecosystems and habitats to big government or big international non-governmental corporations? In the end, wouldn't a better approach be to put our trust in the people and the communities where these ecosystems and habitats are found? They have the most at stake in managing these resources, as their needs and livelihoods are most closely tied to the lands and waters. I believe human beings are basically good. I also believe that, given the opportunity, communities will manage their common interests and keep each other in check. This is the open-source community approach one finds in social networks and in business models such as eBay. I also believe that human beings are the most creative and adaptable species on the planet -- just look at the variety of habitats, climates, and conditions we inhabit. Our resilience as a species is astounding. I argue that we need to embrace this resourcefulness and apply it to overcoming ecological shifts, climate change, and loss of ecosystems and habitats. We need to unleash the power of human creativity to find new ways to "save" those places for future use by both human and non-human species. Unleashing this human capacity will require suspending our assumptions. We will need to focus more on community-based or "commons-based" management (as Jonathan Rowe of the West Marin Commons in California calls it in a recent essay in The State of the World 2008). We need a people-centered conservation that addresses the real needs of real people, and to empower individual entrepreneurs and communities to manage their resources cooperatively rather than impose grand plans from Washington. We need to clearly draw the lines connecting economic prosperity with ecological health and human well-being. And, finally, we need to unleash human creativity to find new technological solutions as well as new ways of living with nature. This may, in the end, be our only hope to really save habitat and ecosystems – and, ultimately, to save ourselves. Fred Wilson pointed me to this new widget I've just added to my blog (see bottom of right sidebar) that will help you print or email pages from The Green Skeptic in a way that will save paper. Of course, not printing it at all will save even more. As Fred described it in his post today: "It's called the ECO-SAFE merit badge. But I call it my blog printing widget. From it, you can email this page, email a pdf of this page, or download a pdf of this page. It's goal is to reduce the amount of paper that is wasted printing blogs." For the past few months I've also been beta-testing a program called GreenPrint World that allows you to reduce the number of pages you print when printing documents. It scans the pages before sending them to your printer and highlights extraneous pages or pages with very little print suggesting you may want to remove them from the print job. It also creates PDFs with one click. The extra step is a bit annoying when trying to print that document on the fly between meetings, but I've already saved 103 pages or $10.40 since installing the program. And having a few extra clicks to make before printing has definitely made me more conscious of what I am printing. Stop what you are doing right now and take 20 minutes to watch this very inspiring talk by 2008 TED Prize winner and author Dave Eggers. His wish? That the TED community personally, creatively engage with local public schools. With charateristic aplomb and earnestness, Eggers talks about "how his 826 Valencia tutoring center inspired others around the world to open their own volunteer-driven, wildly creative writing labs. But you don't need to go that far, he reminds us -- it's as simple as asking a teacher 'How can I help?' He asks that we share our own volunteering stories at his new website, Once Upon a School." Thanks to Paul Pedrosky at Infectious Greed for alerting me to the posting of the video. "Making loans and fighting poverty are normally two of the least glamorous pursuits around, but put the two together and you have an economic innovation that has become not just popular but downright chic," writes James Surowiecki, on the Financial Page of last week's New Yorker. "What Microloans Miss," is another in a recent spate of articles decrying the hype around microcredit (see my earlier post on another such article from the Stanford Social Innovation Review last summer). Microcredit is neither perfect nor a panacea. That's a given, but to claim that the vogue around is more hype than real progress seems a tad overdone. "This vogue has translated into a flood of real dollars," writes Surowiecki, "institutional and individual investments in microfinance more than doubled between 2004 and 2006, to $4.4 billion, and the total volume of loans made has risen to $25 billion, according to Deutsche Bank. Unfortunately, it has also translated into a flood of hype. There’s no doubt that microfinance does a tremendous amount of good, yet there are also real limits to what it can accomplish. Microloans make poor borrowers better off. But, on their own, they often don’t do much to make poor countries richer." True enough. What microloans accomplish best may be a way to provide a safety net for poor people in countries where access to credit and financing is limited. Muhammad Yunus, the "godfather of microfinance," saw the innovation as a way to help poor people escape the usury of moneylenders. "But can microcredit achieve the massive changes its proponents claim?" ask Karol Boudreaux and Tyler Cowen in "The Micromagic of Microcredit," their recent essay in The Wilson Quarterly. "Is it the solution to poverty in the developing world, or something more ­modest -- ­a way to empower the poor, particularly poor women, with some control over their lives and their ­assets?" Boudreaux and Cowen make some good points, many based upon their own experiences in Africa and Asia, and their essay is worth reading in full. "Most microcredit banks charge interest rates of 50 to 100 percent on an annualized basis (loans, typically, must be paid off within weeks or months)," write Boudreaux and Cowen. That's not as scandalous as it ­sounds -- local moneylenders demand much higher rates. The puzzle is a matter of basic economics: How can people in new businesses growing at perhaps 20 percent annually afford to pay interest at rates as high as 100 ­percent? "The answer is that, for the most part, they can’t. By and large, the loans serve more modest ­ends—­laudable, but not world changing." The authors report that "in the Tanzanian capital of Dar es Salaam, Joel Mwakitalu, who runs the Small Enterprise Foundation, a local microlender, told us that 60 percent of his loans are used to send kids to school; 40 percent are for investments. A study of microcredit in Indonesia found that 30 percent of the borrowed money was spent on some form of ­consumption." In the end, the authors surmise, "the cash allows a poor entrepreneur to maintain her business without having to sacrifice the life or education of her child. In that sense, the money is for the business, but most of all it is for the child. Such ­life­saving uses for the funds are obviously desirable, but it is also a sad reality that many microcredit loans help borrowers to survive or tread water more than they help them get ahead." Microcredit provides access to financing to which traditional "informal sector" people do not have access. Banks typically will not loan to the informal sector. Microcredit may even help poor people save more rather than get out of debt, by increasing their asset base -- a family with a cow that provides milk, natural fertilizer and biofuel or helps plow the fields is better off than a family without a cow. Boudreaux and Cowen explain that "microcredit is making people's lives better around the world. But for the most part, it is not pulling them out of poverty. It is hard to find entrepreneurs who start with these tiny loans and graduate to run commercial empires. "The more modest truth is that microcredit may help some people, perhaps earning $2 a day, to earn something like $2.50 a day. That may not sound dramatic, but when you are earning $2 a day it is a big step forward. And progress is not the natural state of humankind; microcredit is important even when it does nothing more than stave off ­decline." Even Yunus, whose latest book is about a new innovation he calls "social business" doesn't claim microcredit is enough to eliminate poverty. What Surowiecki argues for is greater investment in small- to medium-sized businesses (SMEs). He, like Aneel Karnani, who wrote the SSIR piece to which I referred above, argues that "businesses that can generate jobs for others are the best hope of any country trying to put a serious dent in its poverty rate. Sustained economic growth requires companies that can make big investments -- building a factory, say --and that can exploit the economies of scale that make workers more productive and, ultimately, richer." Some others seem to agree, as Surowiecki points out, that "what poor countries need most, then, is not more microbusinesses. They need more small-to-medium-sized enterprises, the kind that are bigger than a fruit stand but smaller than a Fortune 1000 corporation." SMEs represent the "missing middle" that "require backers who want to invest in companies rather than just lend to them." Recently this missing middle got a high-powered group of such backers: Google.org, the Soros Economic Development Fund, and the Omidyar Network have launched a new US$17 million Small to Medium Enterprise Investment Company in India "to create job opportunities and spur greater economic participation for a larger segment of the population." And this is a good thing. For as Jake de Grazia, formerly of PlaNet Finance China, writes on his blog, A More Perfect Market, "all communities are going to need more than just microfinance. Maybe the ideal more is the nurturing of SMEs and the creation of jobs." "The real issue," as Boudreaux and Cowen conclude in their essay, "is that we so often underestimate the severity and inertia of global poverty. Natalie Portman may not be right when she says that an end to poverty is 'just a mouse click away,' but she's right to be supportive of a tool that helps soften some of poverty’s worst blows for many millions of desperate ­people." The question, really, is not whether microcredit is enough, but rather how can we provide the full range of financial services to the poor to which most of us have access? Water is one of the most precious resources on Earth. Clean drinking water is essential to human life -- but only 10 percent of global water use is for human consumption. The other 90 percent is used for a combination of direct inputs to industry, agriculture, transportation, recreation, producing hydropower and cooling nuclear power plants, and sustaining the ecosystems upon which we depend. Over the last century, according to the United Nations, water use increased sixfold, twice as fast as the population rate. The increase has led to water shortages around the globe. Experts from the International Water Management Institute now estimate that by 2025 over three quarters of the people on Earth will be affected by water scarcity. March 22nd is World Water Day,a UN General Assembly designation to call attention to the issue of water scarcity and push for more sustainable management of the resource. Clearly, global water use patterns are not sustainable. Some scientists claim that current water use rates will lead to such a shortage that there may not be enough water to produce the food needed by the world in 2050. Not to mention the potential collapse of important ecosystems and the corresponding benefits, which may have a cascading effect on people and economies. Integrated water resources management may help the situation, as some propose, but it is clear that we need a better method for calculating the true value of our fresh water resources. The bottom line: No longer can we assume that past abundance of water is a guarantee for our future water returns. David Brooks has an Op-ed in today's New York Times on social entrepreneurs. He points to why this emerging approach, which mixes venture capital with doing good, is important and argues for investment in the sector. High winds and turbulent waters have kept us off the beach and boats this year in Hobe Sound. As we retreat to the pool and search for alternative ways to play during Spring Break, it's afforded me more time than usual for reflection. Real estate is in the dumps down here and sales are sluggish, according to people familiar with the situation. Foreclosures in South Florida continue to rise and the region leads the nation in inflation. Even so, just driving around here there seems no shortage of development projects happening in Martin County, despite the economic slowdown. There also seems to be an burgeoning concern about the South Florida environment and increasing sentiment favoring opportunities in the new green economy. Publix Super Markets has a new organic market play, GreenWise, that is designed to capture a growing healthy food market segment. It started with small sections of shelf space in their regular stores, but is expanding to at least three freestanding locations in 2008. Martin County has plans to purchase 1,900 acres of the Harmony Ranch and an additional 1,222-acre property near a Florida Power & Light power plant as part of the Comprehensive Everglades Restoration Plan. Martin County has thus far spent $13.2M of an expected $25M in sales tax revenue for land conservation, according to Jim Sherman, assistant county administrator. A recently released survey conducted by the South Forida Business Journal indicated that a majority of Florida residents approve of increased spending on the state's solar energy infrastructure. Wind projects are also picking up, with St. Lucie Wind leading the way, despite the usual NIMBY hang-ups associated with large wind farms. And Florida's DEP recently commissioned a study to assess the potential for inland wind development. With the wind at 20 mph the past few days around here, it seems an abundant resource. So, the market fluctuations of the past few days continue to play out and potential bank collapses loom. All of this affects South Floridians, especially those in the housing market, as much if not more than elsewhere in the country. In terms of what I see here on the Treasure Coast this week, there is little panic and much forward thinking. Of course, it could just be the effects of four days in the sun, but I don't think so. Update: Representative Tim Mahoney (D-Palm Beach Gardens) on the future of Florida and the Treasure Coast: "We can never be a development-based state again. We cannot build our economy around home building. We're just running out of space. We have to have a new industry; we have to broaden our economy. The things we have to look at that are home runs for us are tourism, eco-tourism, biofuels, biotech." The guys at Clean Edge, a leading research and publishing firm in the clean tech space, have released their 2008 Clean Energy Trends report. They scan the sector for trends and point to "select companies to watch" within those trends. Joel Makower, Ron Pernick, and Clint Wilder (Pernick and WIlder are authors of last year's Clean Tech Revolution) offer a quick assessment of global clean-energy markets, which they say "are expanding rapidly, with revenues in four benchmark sectors — biofuels, wind power, solar photovoltaics, and fuel cells — up 40 percent from $55 billion in 2006 to $77.3 billion in 2007." The four sectors are projected to more than triple over the next decade, growing to $254.5 billion by 2017, according to their findings. One surprising note, in my view, is that the authors don't spend much time on the rapid expansion of solar (especially thin film and thermal) over the past year or point to its rocky start in '08. Maybe that would be stating the obvious. The full report can be downloaded at: Clean Energy Trends 2008. Global production and wholesale pricing of biofuels reached $25.4 billion in 2007 and is projected to hit $81.1 billion by 2017. The global biofuels market last year consisted of more than 13 billion gallons of ethanol and more than 2 billion gallons of biodiesel production worldwide. Wind power is expected to expand from $30.1 billion in 2007 to $83.4 billion in 2017. Last year's global wind power installations reached a record 20,000 megawatts (MW), equivalent in size to 20 conventional fossil-fuel power plants. Solar photovoltaics (including modules, system components, and installation), which totaled $20.3 billion last year, will more than triple to $74 billion by 2017. Annual installations in 2007 were just shy of 3,000 MW worldwide. New global investments in energy technologies — including venture capital (VC), project finance, public markets, and research and development — have expanded by 60 percent from $92.6 billion in 2006 to $148.4 billion in 2007, according to research firm and Clean Energy Trends content provider New Energy Finance. In the U.S., venture capitalists invested $2.7 billion in the clean-energy sector, representing almost 10 percent of total VC activity. "Clean energy has moved from the margins to the mainstream and the proof is in these numbers," said Clean Edge co-founder and principal Ron Pernick. "Amid last year's plummeting housing prices, rising foreclosure rates, and record high oil prices, clean energy continued to provide a bright spot in an otherwise sluggish economy." "More and more these days, you're hearing the word Green. Whether it's Nike introducing a new line of "green" Air Jordans, a band of celebrities and socialites partying to celebrate the opening of a new park on the reclaimed elevated train line known as The High Line, the City Council duking it out over the control of the city's economic waste problem, or Mayor Bloomberg's ambitious initiatives to turn New York into a Green city (congestion pricing! ), we've found here at The Observer that on every beat, there is something to say about the new drive to make the city friendlier to the environment. "Here you'll find in one place all of our reporting on Green New York. "You'll also find a new online colum by Steve Cohen, who will be writing about the new Green New York that's struggling to emerge in the city's social, political, corporate and cultural scenes. Over the coming weeks and months, we'll be expanding this channel to incorporate new material, the product of work going on in our newsroom and in Columbia's dozens of programs and research institutes devoted to the study of the environment and our impact on it." Social entrepreneurs. They have been variously defined as people with game-changing models to address the world's most pressing social problems or individuals who address market failures by using new business models to affect change globally by acting locally. Or just crazy people. Whatever your definition, social entrepreneurs can be pretty unreasonable people: tenacious, stubborn, and focused on pursuing their ideas to the fullest. Judging by The Power of Unreasonable People, the new book by SustainAbility's John Elkington and Pamela Hartigan, until recently managing director of the Schwab Foundation for Social Entrepreneurship, which takes its title from a quote by George Bernard Shaw, there are plenty of them out there ready to take on the world or at least disrupt its equilibrium. Jean-Baptiste Say, author of A Treatise on Political Economy (1803), is credited with coining the term "entrepreneur" as someone who "shifts economic resources out of an area of lower production into an area of higher yield and production." Add the word "social" and you have someone applying that same principle to the concerns of civil society. Wherever there is a market failure that leads to a social or environmental ill, you're likely to find a social entrepreneur coming up with a solution. Whether you're talking about Takao Furuno, whose ducks are used to protect rice crops; Fabio Rosa, who has pioneered systems to electrify rural Brazil; or Wangari Maathai, founder of Kenya's Green Belt Movement, who aims "to plant trees to provide sustainable sources of firewood and halt soil erosion," you're talking about people who will not rest until their idea is realized and the world is changed as a result. These "unreasonable people" are making steady progress not by, "giving a man a fish or even teaching him to fish," to paraphrase Ashoka's founder Bill Drayton, who is credited with coining the term social entrepreneur, "but by revolutionizing the fishing industry." As such, according to Elkington and Hartigan, social entrepreneurs are "highly sensitive barometers for detecting market risks and opportunities." The authors suggest it's an important reason that global corporations are scouting for high-impact social entrepreneurs. But how to find them and where? The social entrepreneurs I know say, "You know one when you see one." After my recent trip to India, where I met half a dozen or so in as many days, I kind of understand what they mean. Elkington and Hartigan offer "Ten Characteristics of Successful Social Entrepreneurs" that may help to call them out, including "Try to shrug off the constraints of ideology or discipline"; "Identify and apply practical solutions to social problems, combining innovation, resourcefulness, and opportunity"; "Show a dogged determination that pushes them to take risks that others wouldn't dare"; and "Display a healthy impatience (e.g. they don't do well in bureaucracies...)." Describe anyone you know? They also offer a useful framework of three models for the types of organizations social entrepreneurs set up: leveraged non-profit ventures, hybrids, and social business ventures, which try to put some parameters around some of the more classic types of ventures. To date, most of the social entrepreneur ventures with which I am familiar are of the leveraged non-profit variety. But issues of sustainability and technological innovation seem poised to demand alternative approaches. Much of this important book draws on the stories of social entrepreneurs from around the globe who are focusing on social value creation. And this is a good and useful thing. Where the authors stray a bit too far afield, in my view, is when they erect too large a tent. While I appreciate GE's ecoimagination as great market innovation, it seems clear that a large multinational corporation such as GE can hardly be described as a social entrepreneur, even if they ditch the company's Six Sigma culture. Even with the disruptive nature of GE's marketing and product development, most social entrepreneurs would chafe at the bonds of their corporate culture. Shedding light on social entrepreneurs who are bringing solutions and innovations to the "epochal challenges" we face is a timely exercise. David Bornstein did it well with How to Change the World, and Elkington and Hartigan have complemented that earlier work in the field. The bottom line is: we need more celebrants of such agents of change and perhaps even need to cultivate the art of being unreasonable. For if Shaw was right that "all progress depends upon the unreasonable man," then we are at risk if we do not call them out and give them the resources they need. It may just save our assets. I spent last weekend with Ashoka Fellow Kalyan Paul and his group Grassroots in Ranikhet, Uttarakhand, one of the northernmost states in India, bordering Nepal and China. Clean Tech: Will Solar Thermal Finally Get Its Day in the Sun? Michael Parekh, in my view, one of the smartest thinkers on Internet and Technology trends, posted this piece on solar thermal tonight, which I am thankful for because I haven't seen the Times in about two weeks! "After a decade of no activity, two prototype solar thermal plants were recently opened in the United States, with a capacity that could power several big hotels, neon included, on the Las Vegas Strip, about 20 miles north of here. Another 10 power plants are in advanced planning in California, Arizona and Nevada. On sunny afternoons, those 10 plants would produce as much electricity as three nuclear reactors, but they can be built in as little as two years, compared with a decade or longer for a nuclear plant. Some of the new plants will feature systems that allow them to store heat and generate electricity for hours after sunset." "The power they produce is still relatively expensive. Industry experts say the plant here produces power at a cost per kilowatt- hour of 15 to 20 cents. With a little more experience and some economies of scale, that could fall to about 10 cents, according to a recent report by Emerging Energy Research, a consulting firm in Cambridge, Mass. Newly built coal-fired plants are expected to produce power at about 7 cents per kilowatt-hour or more if carbon is taxed. The solar plants receive a federal tax subsidy, like other types of renewable energy, which makes the economics work for builders but also feeds skepticism about the technology’s long-term potential. "Unless there's a subsidy involved, it doesn't seem like a very attractive technology," said Revis James, a renewables expert at the Electric Power Research Institute, a utility industry consortium." The whole piece is worth reading, especially if you've been wondering about what all the recent hoop la around solar is all about. Along with wind, geo-thermal and wave energy, it's a critical part of the global renewable energy crusade. It's going to be a long, bumpy road, but the journey may be worth it in the long run. Thanks for sharing this, Michael. Indeed, it's going to be a bumpy road for all renewables, but the two solar plays to watch are thermal and thin film. As for subsidies,the oil and gas industry in the US receives subsidies estimated at $15-35 billion/year, depending upon who is counting (and whether you include things like highway construction/maintenance, which I don't think is fair), and the coal industry is propped up by $60 billion in tax breaks since 1932, including $8 billion included in the Energy Policy Act of 2005. By contrast, the Production Tax Credit, which is supported by the Senate Finance Committee's own Charles Grassley (R-Iowa), amounts to a whopping $5.5 billion. Woot! Sure, alternative energy needs to compete on a level playing field with fossil fuels. But that means either clean tech alternatives should be given equal access to subsidies or subsidies should be removed for all and let 'em duke it out. Aren't subsidies generally considered pro-business? Bring on the New Green Economy! Social Entrepreneurs: Goonj, "One Person's Rags Are Another's Riches"
"What are the three basic human needs?" 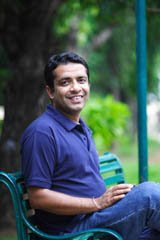 asks Anshu Gupta, an Ashoka Fellow and founder of Goonj. "Food, clothing, and shelter. Everyone talks about hunger and homelessness, but we don't talk about the second basic need." Indeed, argues Gupta, the only time people think about clothing for the poor is after a natural disaster or when some charity has a clothing drive. And what happens to those clothes? Typically, if they are not shipped right away, they are stockpiled for future disasters. Many times without quality control: resulting in torn or soiled clothing or single shoes from a pair being distributed. The usefulness is questionable. Gupta wanted to change all that. "Clothing is a symbol of dignity," he says, without a trace of sentimentality. "We're not promoting charity; we are adding value and professionalizing the collection of discarded materials." Through Goonj, which means "echo," Gupta started a "clothes for work" initiative, designed to help poor people earn their clothes in exchange for work cleaning up and taking care of their villages. "This takes the charity out of it," Gupta shares. "They earn their clothes and help improve their surroundings at the same time." Goonj is run like a business, a social business, and one gets the impression Anshu Gupta could easily be running a large manufacturing or distribution center in the private sector if he wasn't possessed by an idea that clothes are a basic human need that all need access to. The journey starts at one of over 30 collection centers in India's major cities, where volunteers and employees of Goonj sort and process the materials and package it in jute bags, which are all coded according to contents and entered into their database. It's a sophisticated process. One of the centers, in a series of warehouse-like buildings in a modest neighborhood in New Delhi, was a hub of activity on the day we visited. Women were sorting the incoming clothing according to whether it's a male or female garment, color, size, and condition. Other women were sewing articles of clothing in need of repair; if it's beyond repair, it will be used for something else. Two women are sorting through a recently obtained bag of clothes, blue shirts, blouses, pants, and skirts. "They are putting together school uniforms," Gupta says. "Of course they may be slightly mismatched, but the schools where this is going otherwise wouldn't have a uniform, the kids may not even have clothes to wear to school." Goonj is having an impact on dignity, but also on health. 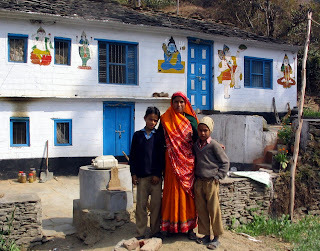 Gupta cites villages in Rajasthan, which is one of the areas on their distribution network. Rajasthan is mostly desert, and most people don't think of desert people needing warm clothes or blankets. But temperatures drop precipitously at night and if you barely have clothes to cover your body, it can be a night of agony. Goonj is making sure that blankets and clothing get to those who need it. Clothes are only an entry point for Anshu Gupta and Goonj. 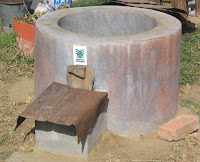 And one of their newest innovations is having tremendous impact on the health of poor women. Sanitary napkins are ubiquitous in the west; a disposable product that most people take for granted. But countless women in rural villages use dirty, useless cloth during their five days of menses, leading to infection and disease. Gupta speaks of one woman who used a piece of an old blouse and died of tetanus because she was unaware there was a sharp metal hook inside. Through its initiative "Not Just a Piece of Cloth," Goonj has developed a cloth sanitary napkin product made from selected scraps of cloth from the sorting process (25 percent of the cloth they receive is unusable as a garment, but can serve other purposes). They provide clean cloth napkins to rural women and women living in slums and campaign in rural and urban India to generate awareness of the need for cleanliness in the monthly cycle. 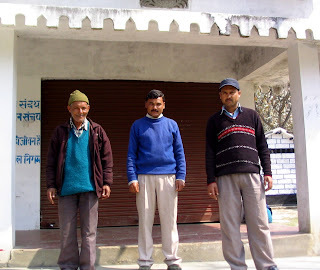 Awareness-building is a big part of what Goonj does, especially where waste is concerned. And as India's economy accelerates so does consumerism and increased wastage. 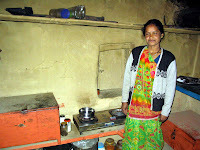 Goonj is concerned that the next generation of Indians understand the connection between consumerism, waste, and poverty. So they have developed a program called School-to-School (S2S), Winner of an Ashoka's Changemakers Innovation Award, to turn the wastage of urban school children into a resource for thousands of rural and slum schools. It also serves the dual purpose of sensitizing urban students and their parents about the needs of the less fortunate. "The urban kid has a fight with his parents between a Pokémon bag and a Spiderman bag," Gupta says. "They have no idea what it's like to fight for a bed." Goonj's target is to support 30,000 children initially by channeling material like used books, uniforms, shoes, school bags, and even furniture to the rural and slum schools. And each year, Goonj hosts an event called "Pratibimb," bringing together urban and rural school children and teachers from across the country who would otherwise never know each other. Goonj sends out over 20,000 kgs of material every month in 19 Indian states. Their small staff is augmented by over 300 volunteers and a distributions network of over 100 grassroots organizations, Ashoka Fellows, social activists, and even units of Indian army in rural India. Recycling is not a new phenomenon, even in India. Indeed, Anshu Gupta says that almost everything in India gets recycled, with the exception of food waste and some plastics. The true innovation here is in the distribution of the materials. Goonj has figured out an elegant solution to ensure that materials get to those who need them all year-round, rather than waiting for disaster to strike. In the end, Anshu Gupta and Goonj are proving the old adage that "one person's rags can indeed be someone else's riches." Postscript: At the India NGO Awards tonight, in New Delhi, Goonj was awarded the India NGO of the Year Award for 2007, sponsored by the Resource Alliance and the Nand and Jeet Khemka Foundation. It is another in a string of recognitions that this organization has garnered.